Or if you get one in your shoe! DOes Kid Shazam have Jimmy Olsen by the bowtie? 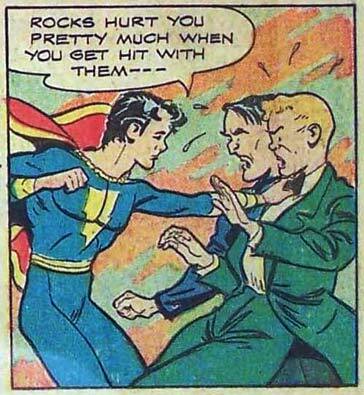 Also, good thing superheroes don’t teach English. I can’t imagine diagraming that fragmented sentence. Obvious statement is obvious lol. I like to think the name of the course is “Things that hurt you when you get hit with them and how much they hurt you.” Day 1 is, of course, rocks, to be followed by churches, bridges, dynamite, Captain Marvel Junior’s fists, pavement, and rhinoceroses. I wish I had been on this site last week. I had wanted to join a soccer team. But, before signing up, I decided to get some practice first. I didn’t want to start out with an actual soccer ball, I figured I’d start small and work my way up. I chose to use a rock first, bouncing it on my knee and headbutting it. And I was like WTF, I’m in a lot of pain here. I couldn’t figure it out, until now. Jeff, when you give out important information like this, you should email it to everyone. It might save someone’s life someday.